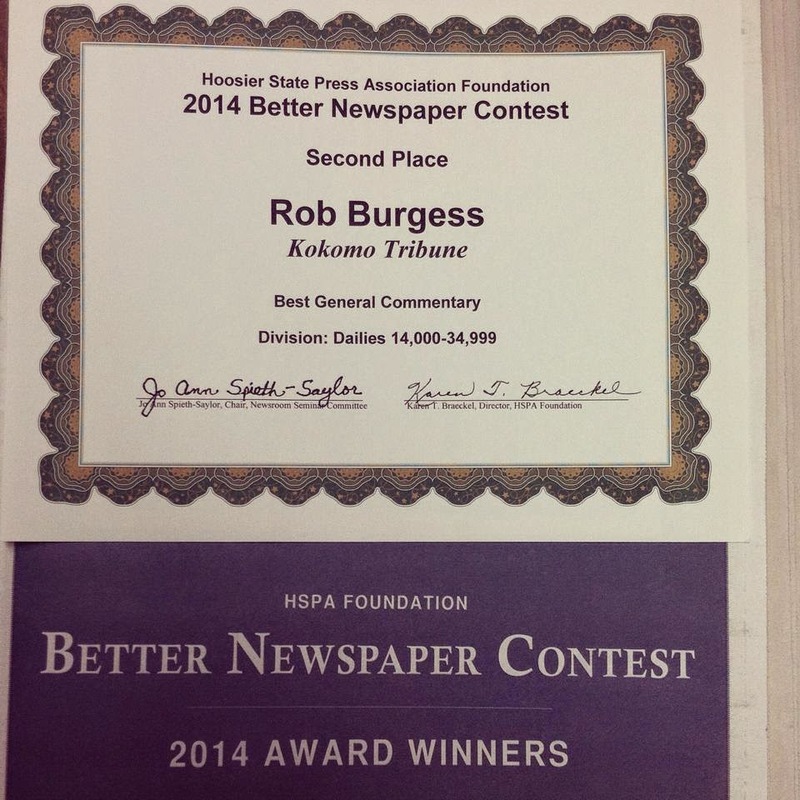 On Dec. 6, 2014 at the 2014 Hoosier State Press Association Foundation Better Newspaper Contest Awards Luncheon and Newsroom Seminar at the Indianapolis Marriott North, I won an award for the second year in a row. I won Second Place for General Commentary for Division 5, which comprises daily newspapers with circulations between 14,000 and 34,999. 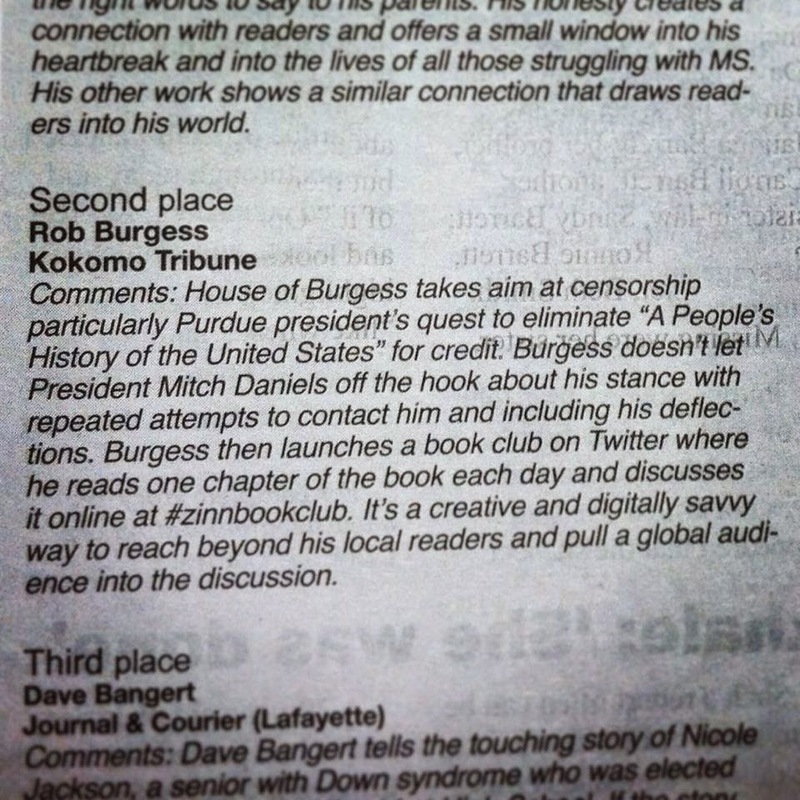 "House of Burgess takes aim at censorship particularly Purdue president's quest to eliminate 'A People's History of the United States' for credit. Burgess doesn't let President Mitch Daniels off the hook about his stance with repeated attempts to contact him and including his deflections. Burgess then launches a book club on Twitter where he reads one chapter of the book each day and discusses it online at #zinnbookclub. It's a creative and digitally savvy way to reach beyond his local readers and pull a global audience into the discussion." You can download a copy of the awards tab here. The Kokomo Tribune brought home eight awards at this year’s Hoosier State Press Association Foundation Better Newspaper Contest. The results were announced at the annual awards luncheon Saturday at the Indianapolis Marriott North. Work submitted to the contest was published between July 1, 2013, and June 30, 2014. Tim Bath, Tribune photographer, also won two awards. His photo, “Champions,” won second place in the Best Sports Feature Photo category. “Nice job capturing a moment,” wrote the judges. Bath also won third place in the Best General News Photo category for his “Clean up” photo. “Nice frame that tells the whole story,” wrote the judges.